We’d love your help. Let us know what’s wrong with this preview of Fierce on the Page by Sage Cohen. Produce your best work. Live your best life. Make your greatest impact. You have everything you need--and you are everything you need--to do the writing you are meant to do. And yet the path to success can be difficult to find and follow. Veteran author and writing guide Sage Cohen believes that ferocity is your best compass for finding your true way forward. She shows you Produce your best work. Live your best life. Make your greatest impact. In this collection of contemplative and inspiring essays, you'll unlock the secrets to naming your deepest desires, eliminating the challenges that hold you back, and committing to your practice. Fierce on the Page is your trustworthy companion for crafting your best writing and your best life. To ask other readers questions about Fierce on the Page, please sign up. Dropped halfway, may pick up later. Not a lot of things I haven't already known, so not really useful at my level. The narrator's voice is also very commanding, so the chapters on how to be gentle to yourself don't look convincing: first a lot of thoughts on how to find your own process, then a lot about schedules and planners. While I do use them, and I appreciate a good schedule, I can see with my mind's eye the reaction of some other published writers I know. For them mere thinking about wordc Dropped halfway, may pick up later. Not a lot of things I haven't already known, so not really useful at my level. The narrator's voice is also very commanding, so the chapters on how to be gentle to yourself don't look convincing: first a lot of thoughts on how to find your own process, then a lot about schedules and planners. While I do use them, and I appreciate a good schedule, I can see with my mind's eye the reaction of some other published writers I know. For them mere thinking about wordcounts kills free form that they love, and gives them a sense of guilt. Also, for a book that says that you need not to try so hard, there is a lot of boot camp attitude here, that sounds painful just by thinking about it. And I'm THE person who overdid the boot camp stuff to herself. For those who like to borrow some energy and know perfectly that all they need is to whip their asses into writerly shape. For the likes of me it's just another self help book, not much substance whatsoever. Extremely useful "self help" book on the psychological and practical aspects of writing and how to overcome doubts and move forward. Sage is open about her own evolution and her advice is encouraging and wise. "As writers, we have a tendency to doubt our choices, question our themes, reconsider our genres, and imagine that every writer on the planet is doing something more important, more impressive, more coherent, and is more likely to result in success." The book is very much focused on the life experiences she had whenever she was writing, from when she was a kid, had breaks, breakups, divorce and the amazing influential good people she attracted to her life that helped her get to where she is. But it's not just that, there's a brilliant learning curve you get from her writing, questions we should ask ourselves (or in my experience, myself - the unpublished writer) about writing. I found myself filling pages after pages of a separate notebook wit The book is very much focused on the life experiences she had whenever she was writing, from when she was a kid, had breaks, breakups, divorce and the amazing influential good people she attracted to her life that helped her get to where she is. She's incredibly talented and finishing this book felt great. There's no clear guide ever on how-to-write, however, in the book she asks wonderful questions any writer or anyone who wants to write should ask himself. I enjoyed everything about this book: the paper it's printed on, the design by Alexis Estoye and most of all the words by Sage Cohen. From the Introduction, "Unleashing the Fierce Writer Within," to the final chapter, "From Impossible to Inevitable," there is inspiration to access your own strengths and "define success on your own terms." "You Are Your Own Best Expert," Cohen advises in chapter one. She offers wisdom from her own experience of committing to showing up and "writing down what wants I enjoyed everything about this book: the paper it's printed on, the design by Alexis Estoye and most of all the words by Sage Cohen. From the Introduction, "Unleashing the Fierce Writer Within," to the final chapter, "From Impossible to Inevitable," there is inspiration to access your own strengths and "define success on your own terms." "You Are Your Own Best Expert," Cohen advises in chapter one. She offers wisdom from her own experience of committing to showing up and "writing down what wants to come through." Many of the 75 chapters begin with a quote such as this one by the poet Hafiz: "Routines are human nature, why not create some that will mint gold?" At the end of most chapters is a section entitled "Be Fierce" which encapsulates the chapter's ideas and offers further tips. For instance: "Choose a writing buddy with a specific, shared goal or purpose, and commit to a half hour once a week, or even once a month, when the two of you specifically address this single issue together." Cohen has a "writing promotion buddy" and I thought, what a great idea! Her buddy sent publishing leads to Cohen for her poetry. Cohen found that her buddy's energy and enthusiasm invigorated her own. They talk every week or two to celebrate successes, share tips, and affirm one another. In "Get Happy First," Cohen realized when seeing a gaggle of geese lifting off "in their symmetry of belonging," that she could be happy without the need for particular things to happen. "There were no contingencies that I could think of to happiness." That changed everything for her regarding thinking in terms of happiness not being dependent on success but "success could very well be dependent on your happiness." Several chapters contain pithy pointers such as the chapter entitled: "How Much the Writing Life Can Hold." One of the tips is: "A Writing Practice is a Life Practice" in which Cohen writes: "In my own literary cosmology, it seems to me that we restore ourselves and our world by arranging the fragments of experience, memory, invention, and emotion into a mosaic of meaning through which we transcend the parts and move into unexpected wholeness." As a divorced mother to a young son, Cohen refers to her new state and all she juggles during a typical day. Besides mothering, she is a writer, an organizer of literary events, and has her own communications business. If anyone knows how to come up a routine that includes her own writing, she does! Cohen has included an essay, previously published, in which she writes about her divorce and the plans she made to write a blog for other parents who are finding their way "into new incarnations of self and family." As she writes about her own family: "All of us have been stretched in new directions." It's an honest and beautiful essay about finding one's way. "Is your writing identity expansive enough to include all of you?" Cohen asks. That question resonates with me as does the idea of writing my own manifesto. Cohen includes her own manifesto about her own writing and teaching identity. Fulfilling goals, making discoveries and expanding a sense of possibility are terms she has used for her students as well as for herself. The manifesto is a distillation of what she believes about writing and what she values. It seems to really sum up what it means to be "fierce on the page." There's so much more to share but best you get the book and be inspired. Reading a chapter of Fierce on the Page before beginning to write would definitely ignite your writing practice. And it would give you a positive boost for living life fully as well. Excellent devotional book that covers the whole inner life of a writer. This book has heart and I will be keeping it by my bed for that quick inspiration or kick in the pants. 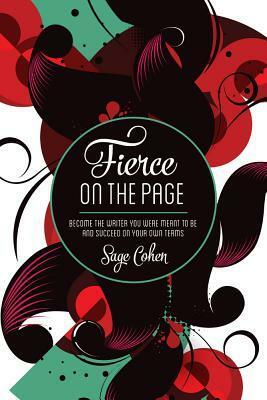 Fierce on the Page: Become the Writer You Were Meant to Be and Succeed on Your Own Terms by Sage Cohen gently, steadily, and apologetically pushes writers to recognize, embrace, and project their fierceness onto the page. Cohen offers short essays, stories, and anecdotal evidence of the techniques she describes for finding one's own inner fierceness. I opted to do the exercises in the book as well as read it and found they deepened the experience quite a bit. Most are simple writing exercises th Fierce on the Page: Become the Writer You Were Meant to Be and Succeed on Your Own Terms by Sage Cohen gently, steadily, and apologetically pushes writers to recognize, embrace, and project their fierceness onto the page. Cohen offers short essays, stories, and anecdotal evidence of the techniques she describes for finding one's own inner fierceness. I opted to do the exercises in the book as well as read it and found they deepened the experience quite a bit. Most are simple writing exercises that take only a few minutes to do though a few are more intensive. All of the exercises are thought and/or emotion provoking, some more than others. I decided to treat the book like a class and do one chapter a day until I completed it. That worked well for me and gave me time to really digest each chapter before delving into the next. Sometimes I couldn't resist peeking ahead to see what was coming up. Cohen writes in a fiercely engaging way that feels vulnerable and strong at the same time. Her guidance feels gentle even with its emphasis on the idea of being fierce on the page. I often discovered myself smiling at the little insights she shared about her life that also gave insight into who she is as a writer. Fierce on the Page reminded me that I be both fierce and gentle with my writing because the key is to be true to myself and the message I want to convey to the world. Fierce on the Page is for any writer who wants to write fiercely enough to let the world hear their roar! I started this book a little concerned after reading some of the reviews. While I saw some understanding in a few of those reviews, I respectfully disagree with the use of this book for writers. The concepts and ideas presented in short inspirational-packed chapters. I enjoyed the ideas provided and while the author eludes to her divorce and single parenthood often it is because she is being open and is sharing what worked for her. She once states that her move from New York to the west didn't m I started this book a little concerned after reading some of the reviews. While I saw some understanding in a few of those reviews, I respectfully disagree with the use of this book for writers. The concepts and ideas presented in short inspirational-packed chapters. I enjoyed the ideas provided and while the author eludes to her divorce and single parenthood often it is because she is being open and is sharing what worked for her. She once states that her move from New York to the west didn't make her "woo-woo" came across to me as if only in New York there is polish and culture. Sadly, it is an elitist mentality that caused me to lose a bit of respect for the writer. Not enough to stop me from finishing the book, or disregarding her ideas and passion, but still I lost a bit of respect for her. It alienated me a bit and left me a bit more skeptical while reading her stories. It is clear this woman is a poet. She writes like a poet and a few times it felt as if she were forcing her poetry on the readers. I remember in a few chapters stopping and saying, what did I just read? it felt a bit disjointed when the flowery language hit a wee bit too hard. Overall, the book is very good almost devotional for writers. For sure worth a read. Additionally, you can get a free workbook from her site when you purchase the book. Fierce of the Page by Sage Cohen was an uplifting read. It’s a book I picked up hoping to become more intentional in my writing. Cohen offers lots of advice. Everything from organizing your writing space to embracing your failures, fears and audience. There are essays on voice and brand, among others. Most short 2 to 3-page essays that are easily digested. Over all a very positive and inspiring book, well worth a read. 1. "joke" about sexual violence on page 207. Amid multiple paragraphs of praise for the person making the "joke"
2. Felt like I was reading a collection of someone's morning pages. Each point was a breezy-easy platitude followed by a personal memory and mention of the author's divorce. 3. One chapter is a sales pitch for a friends' book about parenting. I was recommending this to people when I was only a few chapters in. Good to dip in and out of. Especially good to read while waiting in your car for the AA guy to arrive. Love this. It will be staying on my writing reference shelf! This was great! All authors struggling with mindset blocks should check this out. Not every page or tip spoke to me, but many were wonderful. Inspirational and some helpful hints thrown in. Friendly, engaging writing style. Reading this was like having a talk with a very encouraging teacher or mentor. Sage Cohen was full of great advice, and plenty of permission to pick and choose that which works best for you. Being Fierce isn't just about becoming a better writer - it's about becoming a better you. "Fierce on the Page" by Sage Cohen is a heavenly, inspirational writer's book. I marked on almost every page. I took notes. I was excited and budgeted myself only a chapter a day to make it last longer. Brilliant, motivating, like a big warm hug, then a gentle push towards writing goals. LOVED IT!!!!! Sad to finish...Anxiously awaiting her next book. I first came across Sage Cohen through her book 'Writing the Life Poetic' which focuses on building poetic voice and putting poetry back into our everyday lives. I also had the opportunity of working on my poetry through Sage's online classes a few years back. From these experiences, I come to Sage's works on writing with high expectations of both a pleasurable reading experience and wise, practical advice. And I am never disappointed. 'Fierce on the Page' is a rare and rich read, structured as a I first came across Sage Cohen through her book 'Writing the Life Poetic' which focuses on building poetic voice and putting poetry back into our everyday lives. I also had the opportunity of working on my poetry through Sage's online classes a few years back. From these experiences, I come to Sage's works on writing with high expectations of both a pleasurable reading experience and wise, practical advice. And I am never disappointed. 'Fierce on the Page' is a rare and rich read, structured as a series of 75 reflective essays that offer strategies, perspectives and practices to encourage ferocity in writing and in life. From page one of the first essay, 'You Are Your Best Expert', I was lulled by Sage's reassuring voice telling me stories and building on these to make connections. The essays provide a path to navigate the way into writing and into progressing through many aspects of its craft and life. Each contemplative essay is so thought-provoking. My copy is now full of underlining, connections and possible creations sparked by the reading experience. Sage's practical business writing background is also woven through the pages. There is a blend of wisdom honed from writing experience of all kinds, along with a grounded sense of what works to bring forward new possibilities and how productivity can be enhanced. I spent the last two days reading and digesting Fierce On the Page. It was amazing and so different from any other writing book I've read (and I've read a zillion of them) It is part how to, part encouragement, part philosophy and it gives many insights into the life of a writer. Her wisdom will be helpful to me as I'm about to launch my novel on January 18th. It really enabled me to focus on my brand--something I knew I needed to do, but wasn't quite sure how to go about doing. After I finished I spent the last two days reading and digesting Fierce On the Page. It was amazing and so different from any other writing book I've read (and I've read a zillion of them) It is part how to, part encouragement, part philosophy and it gives many insights into the life of a writer. Her wisdom will be helpful to me as I'm about to launch my novel on January 18th. It really enabled me to focus on my brand--something I knew I needed to do, but wasn't quite sure how to go about doing. After I finished the book, I sat down and typed out every question Ms. Cohen asked. And then I spent some time formulating and typing my answers. Doing this gave me so much clarity into myself as a writer and a human being. Fierce on the Page made me think about my writing joys, challenges, fears and what I let stand in my way from committing to my deepest writing aspirations. The thoughtful and reflective collection of essays are inspiring and motivationally driven. I enjoyed reading them like visiting with a true friend.